There's much more to successful wading techniques than just pulling a pair of chest waders on and charging into the salmon river. Just because a pair of chest waders go all the way up to the chest there are many good reasons why a salmon angler should never ever consider doing that. None of the current chest wader manufacturers advise what your bouyancy percentage levels are while in at mid thigh to mid chest which to my mind is just down right negligent. 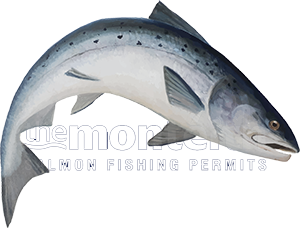 All salmon anglers should be aware that the deeper they wade the less weight they carry which means they can be fairly easily bowled over by the current when wading deep. In addition to this I often see salmon fishers who are out wading deep in the river who have no life jackets on. This is completely bonkers and sadly most salmon fishing seasons bring at least one unnecessary fatality due to this stupidity. All salmon beats in Scotland should have a 'mandatory' approach to the use of lifejackets in my professional opinion as when a life is lost there is no getting it back. Stealth while approaching a salmon pool and when entering the river are key salmon fishing components as salmon are very aware of unnatural movements. Don't just power walk up the gravel riverbank of the pool you're about to fish but instead walk slowly and well back from the riverbank until you reach your starting position. The first thing a salmon should ever be aware of is your salmon fly and nothing else. When you get to your starting position don't do what most anglers do by wading straight in creating a big bow wave before pulling all there fly line off the reel and starting with one big cast. Stand back at ankle or shin depth and start with a short line extending the length of the line by a yard between each cast until you have the length of line suitable for that specific pool application before you slowly sart wading out and then down through the pool. Small careful steps ae the best and safest steps to take especially if you're not familiar with the pool you're wading through. Your feet become your hands so you're feeling your way along the riverbed. If you reach any large stones never step over them as there will always be a deep pocket on the downstream side of all boulders so always wade around the inside edge when you encounter them. 3 feet or 3 small steps between each cast has brought me the most success when fishing so try the same tactic if you struggle to catch salmon. When wading through salmon pools that have a very rocky riverbed it is useful to carry a wading stick to test the depth and contours areas you're wading into and to give you an extra point of contact for stability. All wading sticks should have a heavy duty and secure rubber gromet over their ends so as not to alert the entire salmon population that there's a 'tap dancing' salmon angler approaching. In light gravel easily waded pools a wading stick can be a nuisance but its always a good idea to have one with you on all salmon fishing trips. A good pair of polaroids can be your best friend on any salmon river for various reasons and primarily for sensible eye protection. While wading through a pool polaroids will also give you a greater sense of confidence as they'll allow you to see where you're stepping so always have them with you. Often a good pair of polaroids will allow you to spot salmon lying in the pools of a river especially in the clearer & smaller Scottish salmon rivers.